Sarah Lantz grew up in the Philadelphia area, where she began teaching sixteen years ago. 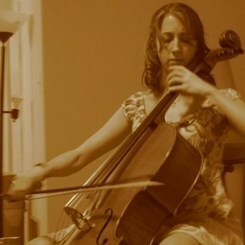 Her bachelor’s degree is in violoncello performance, with a minor in piano, the latter of which has dominated her studio. She is also proficient in music theory, form and composition. In fact, she makes it a point to begin all new students with a foundation of music theory. She studied cello with Derek Barnes (Curtis Emeritus, Philadelphia Orchestra) and Lorne Munroe (Julliard emeritus, principal cellist NY phil under Bernstein and Philadelphia Orchestra under Ormandy). Sarah studied piano with Dr. Carl Cranmer (Juilliard Post-Doc). Lorne Munroe’s stories of Bernstein lectures, combined with Dr. Cranmer’s insistence on proper, safe technique, and finally Derek Barnes’ sheer joy of playing have made her the musician and teacher she is today. Sarah has performed around the world. She studied a summer of chamber music under Dean’s scholarship at Oxford University, where she performed Bach’s G major suite. She has also performed in Milan, Rome, Florence, and Prague. At home, Sarah enjoys practicing obscure chamber music, singing and playing the piano, cardio workout classes, yoga, baking, writing, spending time with her wonderful husband, and feeding her addiction to Korean dramas. Request Lessons with Sarah Lantz today!